Mulleady Commercials & Fabrications breakdown van. The Fabrication Facility at Mulleady Commercials & Fabrications. The Hydraulic hose facility at Mulleady Commercials & Fabrications. The Parts Department at Mulleady Commercials & Fabrications. 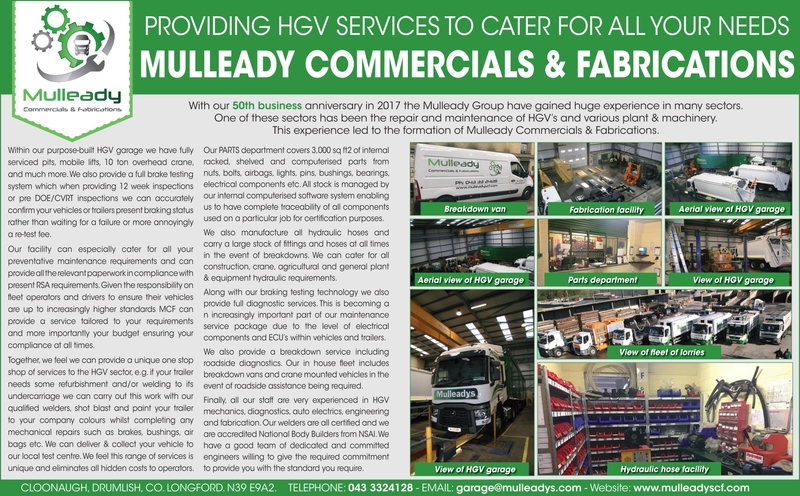 The Mulleady Commercials & Fabrications fleet of lorries. View of HGV Garage at Mulleady Commercials & Fabrications. With our 50th business anniversary in 2017 the Mulleady Group have gained huge experience in many sectors. One of these sectors has been the repair and maintenance of HGV’s and various plant & machinery. This experience led to the formation of Mulleady Commercials & Fabrications. Within our purpose-built HGV garage we have fully serviced pits, mobile lifts, 10 ton overhead crane, increasing demand and much more. We also provide a full brake testing system which when providing 12 week inspections or pre DOE/CVRT inspections we can accurately confirm your vehicles or trailers present braking status rather than waiting for a failure or more annoyingly a re-test fee. Our facility can especially cater for all your preventative maintenance requirements and can provide all the relevant paperwork in compliance with present RSA requirements. Given the increasing demand on fleet operators and drivers to ensure their vehicles are up to increasingly higher standards MCF can provide a service tailored to your requirements and more importantly your budget ensuring your compliance at all times. Together, we feel we can provide a unique one stop shop of services to the HGV sector, e.g. if your trailer needs some refurbishment and/or welding to its undercarriage we can carry out this work with our qualified welders, shot blast and paint your trailer to your company colours whilst completing any mechanical repairs such as brakes, bushings, air bags etc. We can deliver & collect your vehicle to our local test centre. We feel this range of services is unique and eliminates all hidden costs to operators. Our PARTS department covers 3,000 sq ft2 of internal racked, shelved and computerised parts from nuts, bolts, airbags, lights, pins, bushings, bearings, electrical components etc. All stock is managed by our internal computerised software system enabling us to have complete traceability of all components used on a particular job for certification purposes. We also manufacture all hydraulic hoses and carry a large stock of fittings and hoses at all times in the event of breakdowns. We can cater for all construction, crane, agricultural and general plant & equipment hydraulic requirements. Along with our braking testing technology we also provide full diagnostic services. This is becoming an increasingly important part of our maintenance service package due to the level of electrical components and ECU’s within vehicles and trailers. We also provide a breakdown service including roadside diagnostics. Our in house fleet includes breakdown vans and crane mounted vehicles n the event of roadside assistance being required. Finally, all our staff are very experienced in HGV mechanics, diagnostics, auto electrics, engineering and fabrication. Our welders are all certified and we are accredited National Body Builders from NSAI. We have a good team of dedicated and committed engineers willing to give the required commitment to provide you with the standard you require.